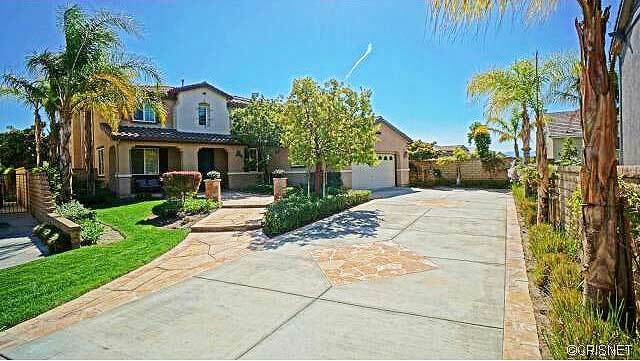 Check out this new listing at 24312 Calle Terraza, Valencia, CA, 91354 as of 02/20/2014 listed in Tesoro Del Valle. 4 + 3 with 3427 sqft. Wonderful Huntington Collection home for sale. View and pool home in sought after neighborhood of Tesoro Del Valle area. Beautiful POOL VIEW Valencia home on a small cul de sac in the Tesoro del Valle community. 4 bedrooms, 3 bathrooms and downstairs office pool and VIEW home. This home is tastefully updated with tons of built ins and wood work. It has a gorgeous gourmet kitchen featuring SS appliances which includes fantastic cabinetry and a huge center island with a second sink and seating for 4-5. Separate room with built in wine refrigerator/ aquarium in breakfast nook off kitchen. A gorgeous limestone fireplace is located in the spacious family room. The downstairs office includes floor to ceiling bookshelves / built in desk and wood floors. Flooring is a mix of carpet and travertine throughout the rest of the home. The home has so many beautiful builder upgrades with wrought iron stairwell, crown molding, and beautiful custom molding around living room entry. The backyard is a mini paradise with a large sparkling pool and spa with waterfall, built in new barbecue and sink, and a large outdoor fireplace. The dual zone a/c makes it an energy efficient home. This flag lot features a stamped concrete driveway that fits up to 14 cars!! This home is perfect for entertaining. This home at 24312 Calle Terraza, Valencia, CA, 91354 is located off Copperhill Drive. There is Mello Roos on this property. Schools for this home are Tesoro Del Valle Elementary School, Valencia High School and Rio Norte Junior High School. All excellent schools and one of the reasons many new home owners with children find reason to purchase in Tesoro Del Valle. See other listings in Valencia CA .